The Japanese bike maker, Yamaha which do not have much in scooter segment in India, will be launching the NMax 155, a maxi-styled scooter by early next year. In the market, the NMax 155 will see the competition with the lately introduced Suzuki Burgman Street 125 that is the only scooter available in the maxi-styled scooter segment from another homegrown bikemaker. Here in this post, we are going to compare both these scooters on paper specs to find that how would they stack up against each other. in terms of designing, both the upcoming Yamaha NMax 155 and the Suzuki Burgman Street 125 share similar maxi-scooter styling. 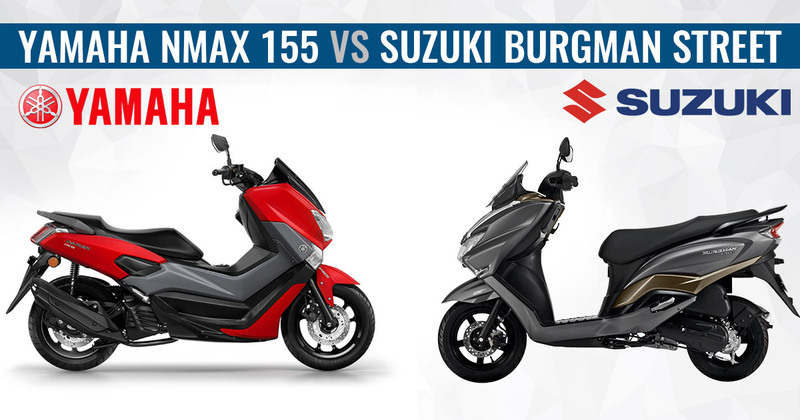 However, the NMax 155 is comparatively bigger in size than the Suzuki Burgman Street 125. Altogether, the features such as a long step-up seat, a split floorboard which lets putting feet on either side along with a windscreen make it a more comfortable ride than the Suzuki Burgman Street on tours. The list of features on the NMax 155 consists of more premium features than the Burgman Street. It gets first in segment features such as LED headlamp and taillamp, all-digital instrument cluster, disc brakes and ABS as well. However, it is not clear yet that the India-spec model will be provided with ABS or not. As it is going to be the costliest scooter in India when launched. So the launch or official revealing of specifications will confirm the packed attributes as standard. With a much powerful 155cc single-cylinder, liquid-cooled engine, the NMax 155 uses the churned power of 14.8 PS and 14.4 Nm of torque on the international specs model. The power transmission is handled by a V-Belt Automatic gearbox transmission. However, the India-spec model will provide similar power figures to be known further during its unveiling. The Suzuki Burgman Street 125 on the other hand, packs a 124cc, single-cylinder, air-cooled engine. It makes out 8.7 bhp at 6500 rpm and 10.2 Nm of peak torque at 5000 rpm via mated CVT transmission. The engine is rated to return the fuel efficiency of 53.5kmpl(ARAI). While the fuel mileage for Yamaha NMax 155 is not known. Boh the scooters in question, the Yamaha NMax 155 and the Suzuki Burgman Street 125 rides on alloy wheels shod up with tubeless tyres. Well, the wheel size on Street 125 is 12-inch on the front and 10-inch on the rear wheel. While the measuring for the NMax 155 is not known. At the front, they use telescopic forks while at the rear there are hydraulic type suspension on the Suzuki Burgman Street 125 and a Unit Swing on the Yamaha NMax 155. The braking responsibilities are under the supervision of front disc and rear drum on Street 125 and disc brakes at both wheels on the NMax 155. The Suzuki Burgman Street 125 has launched in India at the price tag of INR 68347 (On-road, Delhi). While the Yamaha NMax 155 is yet to come by early next year. It is likely to be tagged with the price sticker of INR 80,000 (On-road, Delhi). Comparatively, the Suzuki Burgman Street 125 is costlier as the NMax features a more powerful engine, much features and comfort as well.